A local doctor has joined an elite team of medics who fly with Yorkshire Air Ambulance (YAA). Dr. Chris Srinivasan, a Consultant in Emergency Medicine, usually spends his days treating critically ill patients at Hull Royal Infirmary’s Emergency Department. But if this wasn’t exciting enough, he has recently joined a specialist team of hospital doctors on board the Yorkshire Air Ambulance, enabling him to be one of the first on scene in extreme or life threatening situations. 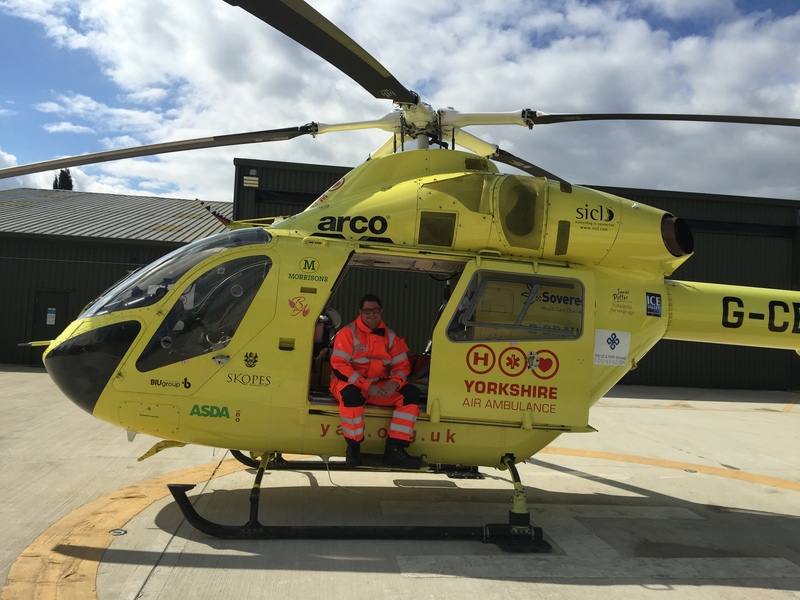 Having just completed a “medical passenger course” (modified air crew course), Chris, who has been in Hull since 2007, now joins a team of 8 other specialist doctors from across the county who fly with YAA. The charity is now able to ensure there is a consultant trained in pre-hospital emergency medicine on board the helicopter, 365 days of the year. Serving the whole of Yorkshire and sometimes further afield, this team of highly trained, specialist doctors and paramedics regularly carries out life-saving procedures, such as emergency anaesthesia and critical care interventions, at the scene of an incident. A member of the team will work on the helicopter 12 hours a day, every day of the year, attending 999 calls when requested. They will work alongside two highly trained paramedics and a skilled pilot. The team aboard the helicopter will fly out to assist critically ill patients in the most urgent situations, as well as providing medical assistance in more remote locations across the county. Seconded by Hull University Teaching Hospitals NHS Trust to the Yorkshire Ambulance Service NHS Trust, Chris joins the Yorkshire Critical Care Team to support the service provided by Yorkshire Air Ambulance and other frontline response teams. “I’ve always been interested in pre-hospital emergency medicine, from the moment I started my career in emergency medicine. No two days are ever the same, the job is so varied and provides me with an opportunity to work with such a fantastic close-knit team. The Yorkshire Air Ambulance relies on the generosity of individuals and organisations to help save lives across Yorkshire. It serves five million people and has carried more than 6,800 people in its 15-year history.